Thursday morning was one of my most irritating moments in the Internet. I usually Bing every morning to see what is going on in the world, but somehow today I accidentally went to Google. But wait a second, I thought I went to Google but it looked like Bing - A big background image. My first thought is how can I get this away. I Googled for “how to remove the background image on Google”, and learned that this kind of search was under the top 10 of the day searches (http://www.Google.com/trends/hottrends?sa=X&date=2010-6-10). I did want to tell a co-worker about this new change, since Google had just a month ago a re-launch of its page by adding the left hand navigation. Which was only the 8th change since Google exists. 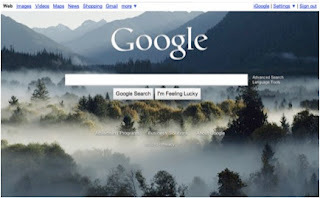 I have to admit I use as well iGoogle and there I have on top a customized image. But I never saw one on the main Google.com page. My co-worker (a social and mobile specialist) was not in yet. 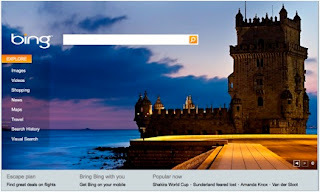 I did some research and did find a Google company blog telling about the new feature and that a user even can choose their own image (Bing does not offer this function but has everyday another image as background) and tons of search results (2,060,000 for “remove background image from Google”). Some explaining that starting on Friday we will have a button to remove the image (http://www.google.com/support/websearch/bin/answer.py?answer=180720&hl=en). I must have been in a time capsule and missed all new features on Google, or maybe I Bing too much. Anyway I forgot after this to talk to my co-worker and went into a lot of meetings. At 3pm I did want to tell him about this and went to Google to make a screenshot. My world is repaired again. The clean white so proper Google search page. How I know it how I loved it.